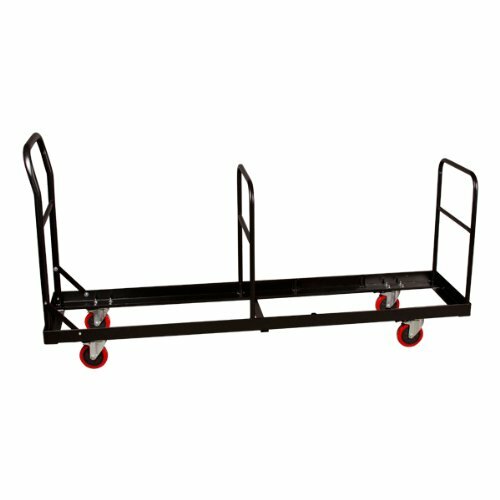 Move and store folding chairs with ease when you use Norwood Commercial Furniture’s Folding Chair Dolly. This steel dolly’s powder-coat finish prevents scratching. Handles on either end and four casters at the base help you transport folding chairs throughout your building. The sturdy steel construction features a powder-coat finish that resists scratches and dents. Handles on either end and four swivel casters at the base help you transport folding chairs throughout your building. Large, 4-inch casters make it easy to maneuver. Accommodates up to 35 standard folding chairs or up to 28 tablet arm folding chairs.